(Newser) – Everyone dies, and frequently it's what we eat (or don't eat) that's killing us. The Guardian reports the newest results from the massive, ongoing Global Burden of Disease study show diet is a factor in one of every five deaths around the world. That means millions of people are consuming too much salt and sugar and not enough whole grains, fruits, seeds, nuts, and fish oils. “It is amongst the really big problems in the world," says Dr. Christopher Murray, the head of the Institute of Health Metrics and Evaluation at the University of Washington. a humans plan is to find ways to keep your body and mind working for as long as you can to keep consuming as much as you can... soon they will extend life so long that we will have lots of 100 plus year olds wandering around... but how will it all be sustainable..
Few of us actually deserve to die. But, alas, we all have it coming to us. Personally, I eat a fine mix of fish, fruits, vegetables, nuts, 15 bean soup, 5 rice blend and yes, some meat and dairy. Moderation in all things is key. 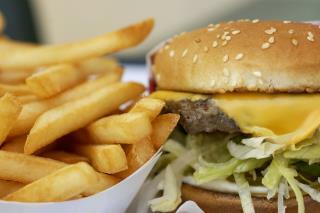 The article neatly sidestepped the SAD truth (Standard American Diet). Here is part of the text from this link: http://www.fundamentalsofhealth.com/sad1.htm 1. 50% of all Americans die from heart attacks and strokes (heart disease) 2. 33 % of all Americans die from cancer (1 in 3). 3. 8% of all Americans die from diabetes. 4. Every 25 seconds someone in America suffers a heart attack. 5. Every 45 seconds someone in America dies from a heart attack. 6. Most common cause of death in America: heart attack. 7. Risk of having a heart attack by average American: 50%. Risk of having a heart attack by average American vegetarian: less than 4%. 8. Amount you reduce your risk of heart attack by eliminating meat, dairy and eggs from your diet: over 90%. 9. Increased risk of breast cancer for women who eat meat compared to non-meat eaters: over 4 times. 10. Increased risk of fatal prostate cancer for men who consume animal products compared to vegetarians: 3.6 times higher. 11. Increased risk of fatal ovarian cancer for women who consume animal products, compared to vegetarians: 3 times higher. Some of the diseases commonly prevented, consistently improved and often cured by a low-fat, vegetarian diet include: Strokes, kidney stones, prostrate cancer, diabetes, peptic ulcers, hemorrhoids, obesity, salmonellosis, heart disease, breast cancer, pancreatic cancer, stomach cancer, hiatus hernias, gallstones, arthritis, trichinosis, osteoporosis, colon cancer, ovarian cancer, endometrial cancer, constipation, diverticulosis, irritable colon and gout.